Two decades after the end of central planning, we investigate the extent to which the advantages bequeathed by planning in terms of high investment in physical infrastructure and human capital compensated for the costs in allocative inefficiency and weak incentives for innovation. We assemble and analyse three separate types of evidence. First, we find that countries that were initially relatively poor prior to planning benefited more, as measured by long-run GDP per capita levels, from infrastructure and human capital than they suffered from weak market incentives. For initially relatively rich countries the opposite is true. Second, using various measures of physical stocks of infrastructure and human capital we show that at the end of planning, formerly planned countries had substantially different endowments from their contemporaneous market economy counterparts. However, these differences were much more important for poor than for rich countries. Finally, we use firm-level data to measure the cost of a wide range of constraints on firm performance, and we show that after more than a decade of transition in 2002-05, poor ex-planned economies differ much more from their market counterparts, in respect to both good and bad aspects of the planning legacy, than do relatively rich ones. However, the persistent beneficial legacy effects disappeared under the pressure of strong growth in the formerly planned economies in the run-up to the global financial crisis. Find below a list of the research I am currently completing or that has been recently published. “Migration and the Equilibrium Prevalence of Infectious Diseases”, working paper with Alice Mesnard, available here. “How Does Ranking Affect User Choice in Online Search?”, working paper with Mark Glick, Greg Richards and Margarita Sapozhnikov, available here. “Cooperation Against Theft: A Test of Incentives for Water Management in Tunisia” (with Wided Mattoussi), forthcoming in American Journal of Agricultural Economics 2013. Available here. Scott Morton, Fiona and Seabright, Paul, 2013 “Research into biomarkers: how does drug procurement affect the design of clinical trials?” Health Management, Policy and Innovation 1(3): 1-15. Available here. Professional Networks and their Coevolution with Executives’ Careers: Evidence from Europe and the US (with Nicoletta Berardi). Working paper, available here. Figure 1 above, drawn from that paper, shows how executives with larger networks are more likely to move between firms. “The Birth of Hierarchy”, in Calcott et al (2013 forthcoming): Cooperation and its Evolution, MIT Press. PDF available here. 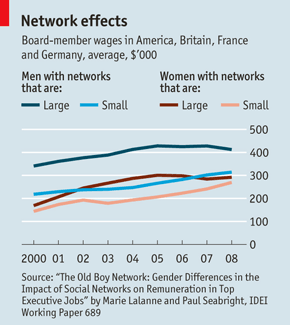 “The Old Boy Network: Gender Differences in the Impact of Social Networks on Remuneration in Top Executive Jobs”, IDEI Working Paper, no. 689, octobre 2011 (with Marie Lalanne), revised September 2012.